and what do we do with them after we collect them? Collecting fishes is essential to our fish survey work and to learning more about our fishes. But catching and identifying fish specimens is only the first part of this learning process. What happens next? After the fishes are brought to our base camp (or field laboratory), they are sorted to species, and some colourful specimens, or those for which we do not have colour photographs, are selected for photography. It is important to photograph fresh fishes before they are preserved in formalin. Colours fade quickly after death, and most of the colour pattern has gone after the fish has been in formalin for a few days. Because colour patterns are useful (essential for some species) for identifying fishes, a good colour photograph of the fresh fish makes it much more valuable as a voucher specimen. If we have made a large collection, we will have to spend several hours identifying, photographing, preserving and listing all of the species from this one collection. Small fishes (less than 5-7 cm) can be dropped directly into the 10% formalin preserving solution (10% concentrated formalin + 90% water and fish). To ensure proper fixation of the internal organs of specimens larger than 8-10 cm, we inject 10% formalin into their abdominal cavity with a hypodermic syringe. And fish more than 20 cm long should also have some formalin injected into the large body muscles for satisfactory fixation. After a week or two back in Grahamstown, the formalin is poured off; the fishes are then rinsed in fresh water and transferred to a 60% solution of propyl alcohol for long-term storage. Formalin is a powerful fixative, so one must be careful when using it. Inhaling formalin fumes is bad for the lungs, and any formalin spilled on the skin should be rinsed immediately with fresh water. 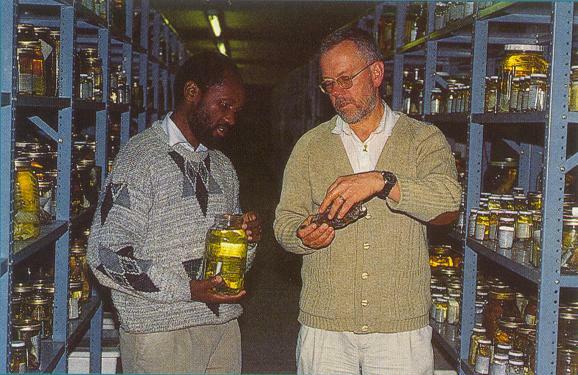 Next, the identification of all the specimens of each lot (bottle of specimens of one species) is checked. For some species, the identification is not obvious, and it may require examining the specimen under the microscope, checking with published descriptions and illustrations, and comparison with previously identified specimens in our fish collection. After the identification is confirmed, the specimens are counted, and the size range (length of smallest and largest fish in the lot) is noted. Now the lot is catalogued (given a unique serial number, with the associated data entered in our fish collection database). A water/alcohol proof jar label is printed out with the scientific name of the species, number of specimens, locality, catalogue number, date collected, name of collector and the family number. Finally, the bottle is put in our fish collection, where it is placed alphabetically under the species and genus names in each family. Now the fishes are accessible, and their associated data have been entered in our collection database. and Phil Heemstra examining fishes in the Institute’s fish collection. Our fish collection is the largest in Africa, and we have the largest collection of southern African fishes in the world. This collection is a priceless research tool and important international scientific resource. We loan specimens to ichthyologists all over the world, and we exchange specimens with museums in the U.S.A., Canada, Brazil, Argentina, Chile, Europe, Australia, New Zealand, Japan, Taiwan, Singapore and Indonesia. We generally use the post to send specimens to museums and ichthyologists over seas. The fish are wrapped in wet cloth and sealed in a thick plastic bag; the bag is then packed in a sturdy box with styrofoam packing material. 1) Providing reference specimens essential for identifying fishes. 2) Providing specimens necessary for the study of the taxonomy (evolutionary relationships) of fishes. 3) Storage of voucher specimens for ecological, biological, and toxicological studies of fishes. This may be important if there is some question about the identification of the species involved in the research. 4) Providing identified skeletal material and otoliths (ear bones) for comparison with bones recovered in stomach contents in research on fish predators (e.g., fishes, birds and marine mammals) and bones uncovered in archeological studies of the diet and uses of fishes by prehistoric cultures. 5) Documenting fish distributions and fish communities in order to monitor the marine and estuarine ecosystems of southern Africa.